It is possible with s9y to moderate blog comments after a certain amount of time has passed since the article was published. A new comment has been posted on your blog "nion's blog", to the entry entitled "security of scponly/sftp-server in combination with apache". This is quite obviously a spam comment to increase google ranks or site links in general. Weird.. I found myself back here! small world. Reminds of this one from the commmandline kung fu of wietse. This comment is pointing to the same spammer site. Now comparing this comment to the first one at the first glance it seems even related to the blog post! 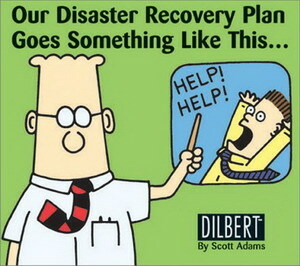 Thinking of "wietse" the name Wietse Venema (author of postfix) pops up, so this also familiar. Though opening a fifo in the home directory, a netcat listening tcp port on localhost with the output redirected to a file and then some tmp file piped to the listening port (thus writing the file) and attaching script to the FIFO doesn't really make sense?! Not that this is usually the case with spam, but wtf this is everything but obviously spam. If you have a blog that is commented highly frequent it might be a problem to sort that out and spot that even if it's not interesting to you. This is the difference to email, if it's spam, you don't notice but it's also not interesting you will just delete the mail. Using a blog you might approve such a comment as it might be interesting for another reader and you don't have time to read that in detail. So this spam hit me 6 months after the first attempt again! It's interesting to see how spam evolves over time, this one clearly has been improved. 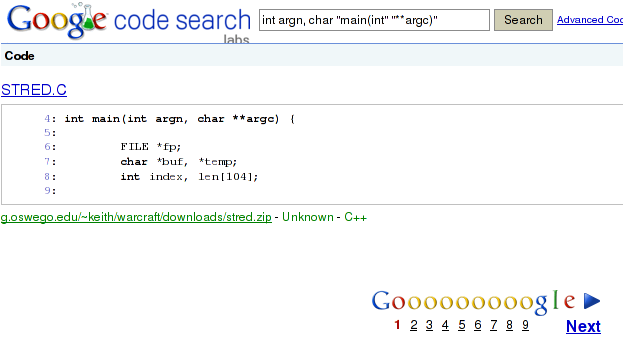 ... or you search for int main(int argn, char **argc) (I was looking for source code snippets that do not use the typical int argc, char **argv names) the google code search behaves rather strangely. 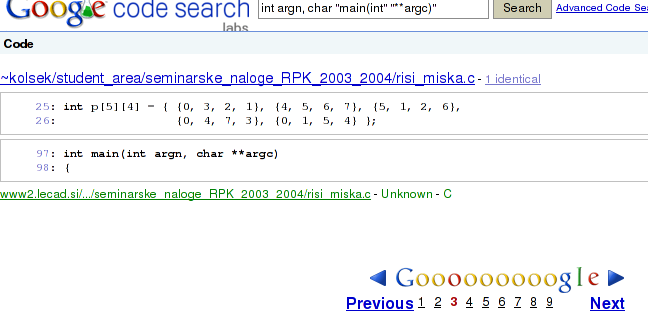 this is not too surprising as the google code search features regexes and * is a reserved symbol in POSIX extended regular expressions but at least the recommendation of int argn, char "main(int" "**argc)" is a bit surprising. Searching for this actually results in a function that matches the string you wanted to search for originally. So far so good, I didn't look into the codesearch syntax in detail, so this might make sense. Note that the result has 9 pages (the screenshot is missing this detail) but also only 9 results. The first question that arises is: Why do they only display one result on the page instead of n (usually they do display more)? Now where have pages 4-9 been gone? Ok, to be fair, google sometimes strips additional search results if the content is too similar, this is not too surprising. Tada, pages are there again! At this point I am/was totally confused and am really wondering what the idea behind this behaviour is. 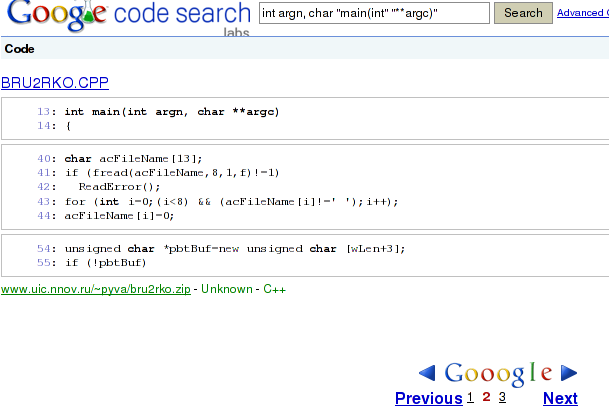 If someone is using the google codesearch more frequently (or even is a google employer) please enlighten me! 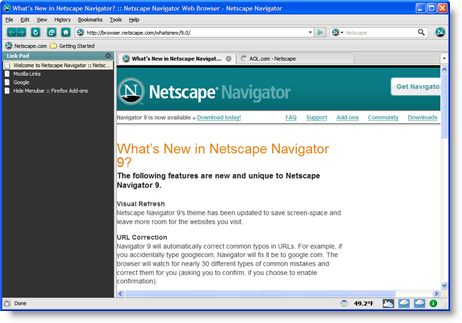 I just noticed (a bit late) that the famous cross-platform browser Netscape 9 was released by AOLOL^h ^h. There is also a list of new features. What I really wonder about is, what is the purpose of this browser and this release? I just tried it and (ok I am an opera user) it really feels and looks like firefox, the code is based on firefox code and apart from a better QA work I don't see any real advantage here. Today the country specific web sites of wikipedia like for example de.wikipedia.org were not available for some minutes. because some days ago Dell announced that they will sell computers running Ubuntu and now Dell Joins Microsoft and Novell Collaboration.